I haven’t done a pineapple update in some time. Two are going really well with lots of new growth; the two others are barely holding their own. Nancy found another “deal” and picked up 6 more. I cut them up for future use in the blender and planted the tops directly in the main garden. Simon came home from his gig in Alabama and spent the first couple of days here at the lake helping me with jobs that are just too much for one guy – at least this one guy. We sawed timber, cut jungle, pulled monster ferns and all those things I should have been doing for the past 6 months. I kept up with him fairly well – probably a few extra breaks for me – but I sure slept well, as in total exhaustion, those nights. He’s got two jobs in Orlando but the plan is for him to do an occasional return here to help out and earn some pocket money. One job that we didn’t finish was pulling runaway Boston fern from the coquina wall along the front deck. We were making great progress when I was slammed by a large wasp just under the eye. If you’ve never had a large bee like sting – sting is an understatement – it’s just as if you were hit by a fast pitch with a hardball. My face was swollen for a couple of days but my eye never closed. Simon spotted the nest way down in the fern and took care of it with wasp spray. I’ll work on the fern a bit or let it wait until he comes back – yeah that. In the meantime, Si will be aggressively seeking full time employment as an environmental teacher somewhere in Central Florida – maybe even up here. Took my first surf fishing trip since the stent work. I dropped Nancy off at her Palm Coast Bridge Club and was making my first cast 15 minutes later. I went south to Beverly Beach instead of north towards Marineland where I had been going. I just like it better. The beach has more contour which, in my mind, makes for better fishing. I had zero problem getting from the car to the beach, climbing over the sand berm with all my gear; zero problem with casting; zero problem landing giant fish (just caught a few small ones) so I’m completely back in the surf business for the summer. A guy fishing nearby did hook a really large stingray that pulled him along the beach a few hundred yards. He was handicapped physically so I helped beach the monster. Then the highlight – Chris came home for a couple of days. That’s a big thing for him since he doesn’t do hot weather very well. We hooked up for dinner one night with Joey and Tommy et al; went over to the beach for lunch at the Funky Pelican and then drove up to St. Augustine. The plan was to walk around the main street in the village but parking was absolutely impossible so we ended up detouring to some outlet malls and coming back to the lake. One thing Chris missed about Florida from his college days was eating Publix sub’s so we stopped and picked up a few a picnic at home. He may come back for another short visit in the fall or we may drive up to Chicago for a couple days later this summer. Nothing definitive but a real possibility. Nancy is on vacation. Salt Lake. I’m on vacation. Barberville. She’ll be gone for a week and has a pretty full schedule of events on tap. I’m going fishing. In the lake. As luck would have it, Chris is also scheduled into Salt Lake with enough overlap to meet for dinner Tuesday night. 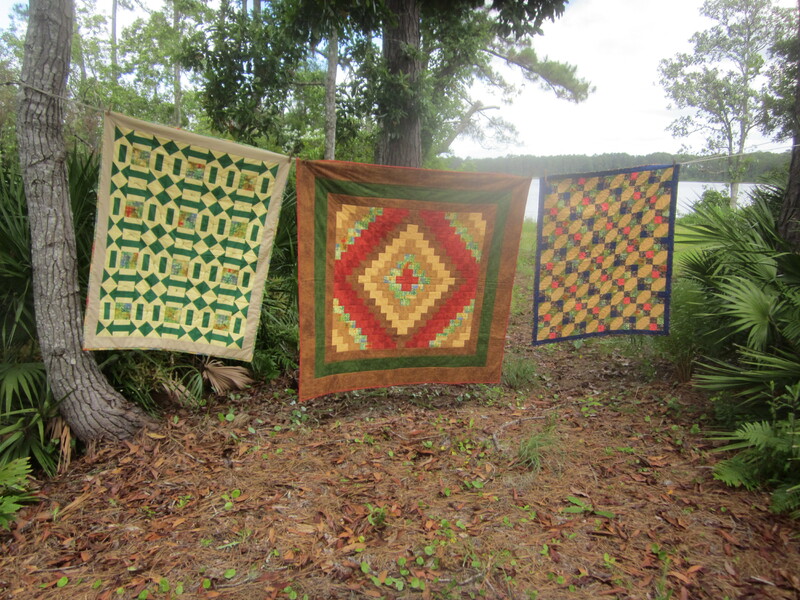 The other coincidence is her quilting buddy lands within hours of Nancy from a midwest quilting event so it will be the three of them for dinner. In honor of that dinner, I’ll go fishing and promise to think of them while I’m casting. Oops, update. The plane was delayed to the point where she would have missed the connection from Atlanta to Salt lake so when I got home the phone was ringing with Nancy on the other end telling me to come back to the airport to pick her up. This is a full shot of the garden to give you an idea about how tall things are. 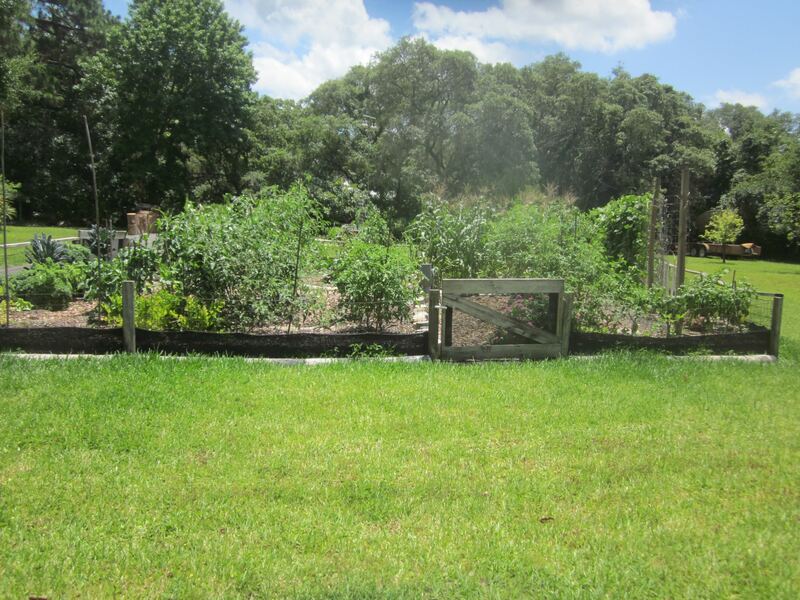 The tallest, excluding the corn and trellis plants are tomato plants. Several are surprisingly over 6’ tall and loaded with green tomatoes. The plants in the near right corner are jalapeño peppers, loaded with ready to pick peppers; the left corner, running along the front are kale plants, still producing past mid May. The first row to the right of the kale are green pepper plants that seem to me to be twice as tall as I expected. Lots of blossoms on the pepper plants and a few mini peppers forming. You can’t distinguish them but there are 7 eggplants just forming blossoms. We went for quite a spell on the lake where the bass fishing was poor. For whatever reasons the fish had moved from all the traditional shoreline cover and moved out somewhere in the middle of the lake. They’re baaaaaack. Tom fished it a couple of times from the poke boat and caught a few and I took it out a few nights and had more action each time than I had been experiencing for the past 6 months. Back to the evening pattern – hit the lake about 7PM and fish until dark. I didn’t mention that I found out there are limits to how much physical stress I can experience before triggering some chest discomfort. The facility in Alabama was hilly with a couple of runs a few hundred feet long with a 10-12% grade. About 3/4 of the way up one of those I started to experience some chest pressure. I stopped and rested until it cleared – it was nowhere near as severe as the one that got me to the emergency. I had the nitro with me and really never thought about using it. A few hours later I tried again with the same result so maybe I need to either avoid that kind of thing or build up to it. I’ll mention it to the doc when I see him in a couple of months. I was a little surprised since you figure the blockage that caused the whole thing was fixed – so what’s this all about? I guess it must be figured in or they wouldn’t tell you to carry nitro. The trip to Alabama was a total success. The fishing could have been better but we did manage to catch fish two out of the three days we put in but the highlight of the trip was getting to attend a couple of Simon’s teaching sessions where he was dealing with about fifty kids, 10-12 years old. I know I’m biased but I was really surprised at how well he controlled the mob and was able to interact professionally with them. The first class was a raptor handling demonstration and tutorial on all facts raptor. He knew the material and handled some unruly birds while totally engaging with the audience for two hours. There were a couple types of owls, a bald eagle, a falcon, and a red tail hawk. Personally I learned quite a bit and it sure seemed like the kids were soaking it up. The second class was on fresh water invertebrates in which he led the kids to the lake to collect species and then marched up to the classroom to learn the hows and whys of these critters – right down to examining them under microscopes. It was remarkable to see how interactive and totally captive to the material they all were. This was about yucky, living organisms such as dragonfly nymphs. The concept he was teaching was how to perform a numerical analysis on the biology of the items they found in order to quantify the quality of the water. Not really a simple concept but it seemed to me, based on the questions and answers, that most of them got it. We got to meet Si’s many friends and co-workers who went out of their way to tell us how much they loved him. We got to explore the small rural Alabama town of Columbiana where they spend much of their leisure time. To position you, Columbiana is about 75 miles south east of Birmingham – rolling hills and farm land. We got so into the town that Tom is now carrying a library card from there – had to join to conduct some business crisis that came up while he was away from the office. We ate at all the recommended places – such as Bernie’s where you literally have to go there to find out if they’re open and serving. Sometimes they do lunch and dinner, sometimes just lunch, and sometimes not at all. Had lunch at a drugstore soda counter which transported me back about 60 years. And Anny’s where she serves cafeteria style with no menu – decides when she comes in what she’s going to cook that day. We missed the barbecue at the Chevron station because the guy with the smoker didn’t show up while we were there. 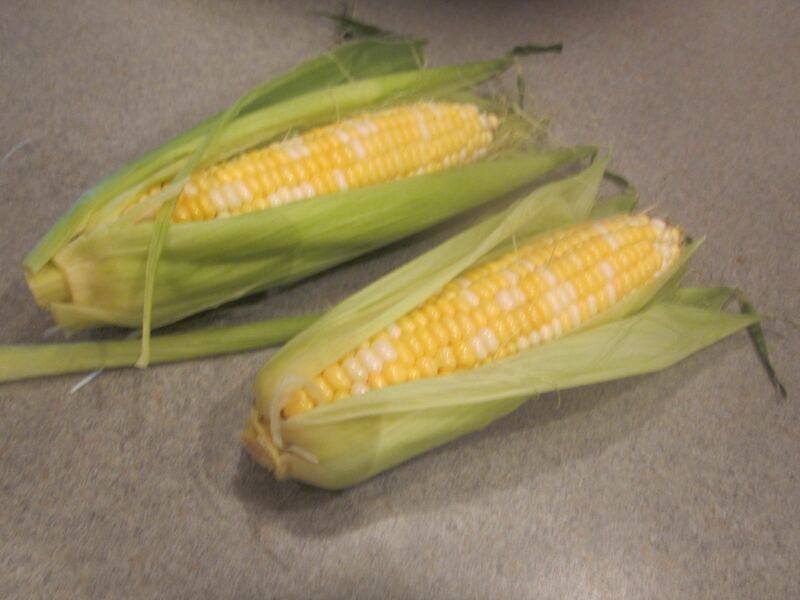 George picked the first corn while I was in Alabama and reported it as “perfect”. Good call. So far it’s light years ahead of previous crop attempts in terms of plant quality and yield. It’s a bi-color variety called Peaches and Cream. Very tasty, especially when it’s cooked within 5 minutes of picking. Also a few plum tomatoes ripened while I was gone. They’re larger than any I’ve grown in the past and cosmetically flawless. Usually there are blemishes caused by bugs and who knows what, but these are good enough for a Publix ad. I will say that I took more care in planting these seedlings than my normal practice so that could be the difference. Alternatively and equally likely, the weather has been perfect for the garden, more or less the whole time since planting. I’ll split credit with mother nature. 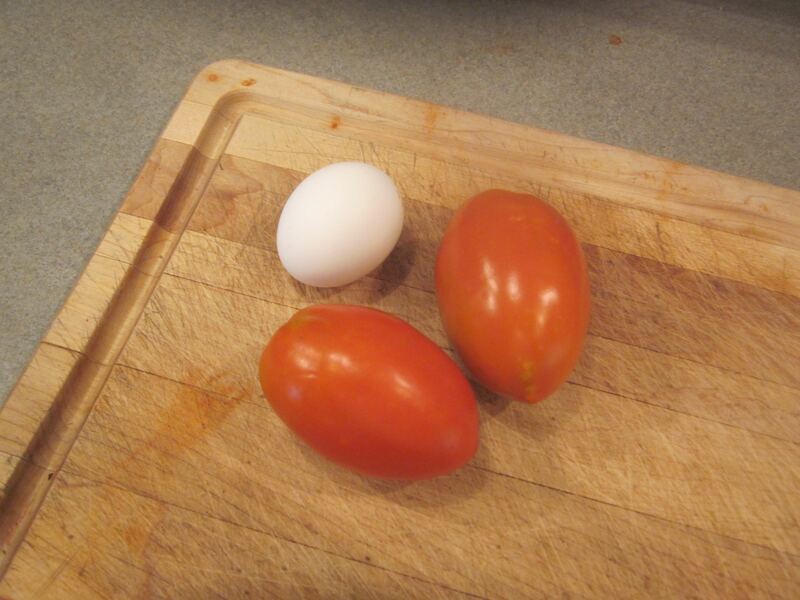 I put the egg beside the tomatoes to give you a size reference. The cucumbers and pole beans are the largest you’ve ever seen but the varieties are such that they remain sweet and tender even when double the size you’re used to. When Tom left for home, he had a large bag loaded with kale, green beans, cucumbers, cherry tomatoes, zucchini, and a couple ears of corn – like a visit to the Farmer’s market but with better prices. We had a nice Mother’s day at the lake. Tom and his family, all of them, plus Joey made it up. The dinner itself was actually the one planned for Easter that was aborted with my stent activity. I leave today for the Alabama fishing trip. Assuming everything goes as planned, nice weather, I’ll be home on Friday. Not too long after I get back, Nancy takes off for Salt Lake. It turns out that Chris has a business trip to Salt Lake and lands there from Chicago within a couple of hours of Nancy so they’re planning to hook up for dinner. As it further turns out, her quilting buddy, Barbara Jones, also lands in Salt Lake the same afternoon and will join the dinner party. Here’s an interesting nature story – I mentioned a few posts back about recently burying loads of fish carcasses into the garden and taking extra precautions against buzzards. They seemed to have worked and have not seen the first attack. I think that came really from the fact that the fish were freshly caught when buried this time as compared to the earlier planting when the fish had been out for a few days ripening. I had some seedling tomato plants that were ready for the garden so I decided to plant a couple directly over the batch of carcasses planted a few weeks ago. I anticipated that there would still be some signs of them but mostly gone. I had buried them down about a foot and sure enough there were no signs of the bones or hides but what I did find was a layer, a thick layer, of maggots. I can’t imagine flies had dug down that far to get at the fish so assume that in the few hours between when they were cleaned and then buried, the eggs were planted. What surprised me was that they were apparently thriving under a foot of soil. I wonder if the larvae will convert to flies and be able to dig out or just become part of the compost??? Picking more beans than you can imagine, beautiful cucumbers, cherry tomatoes and it looks like we’re within days of starting to pick corn. George picked one a week or so back because he was convinced they were ready – even though I gave him a May 18 date. He pronounced that the crop was not going to happen – that pollination had just gone bad – total crop failure. I looked at the ear he’d picked and it looked good to me, just a few weeks premature. Last night he picked another and came to the house to tell me it looked like I was right – this one was about 90% there. (He eats them raw and declared it sweet and delicious). I told him the May 18 date was still good and that the ear he picked could use another week or so in the garden to reach perfection. I’m starting to get my hopes up that we’ll be in full corn overload mode soon. Just when Nancy is landing in Salt Lake. Picking cucumbers and loads of green beans. Expect cherry tomato action to pick up big time next week. 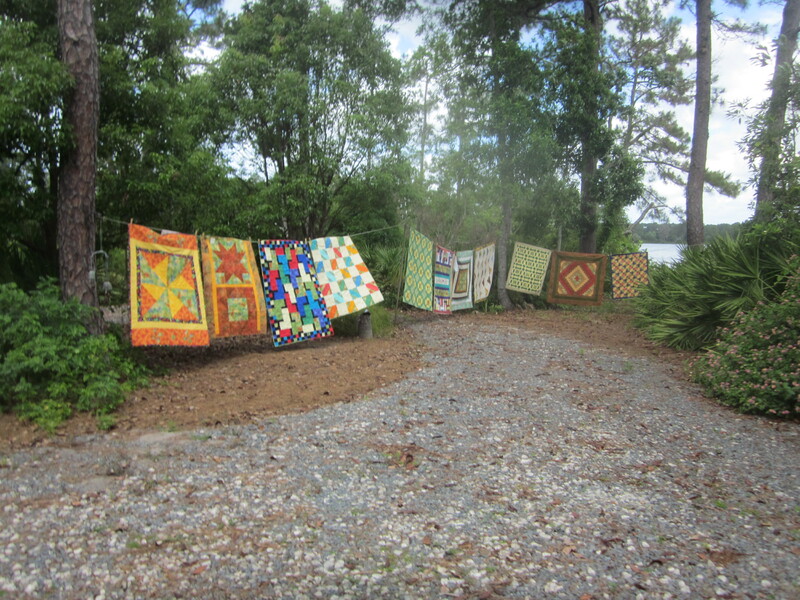 This was Nancy’s quilt group’s 8th annual quilt airing at the lake. 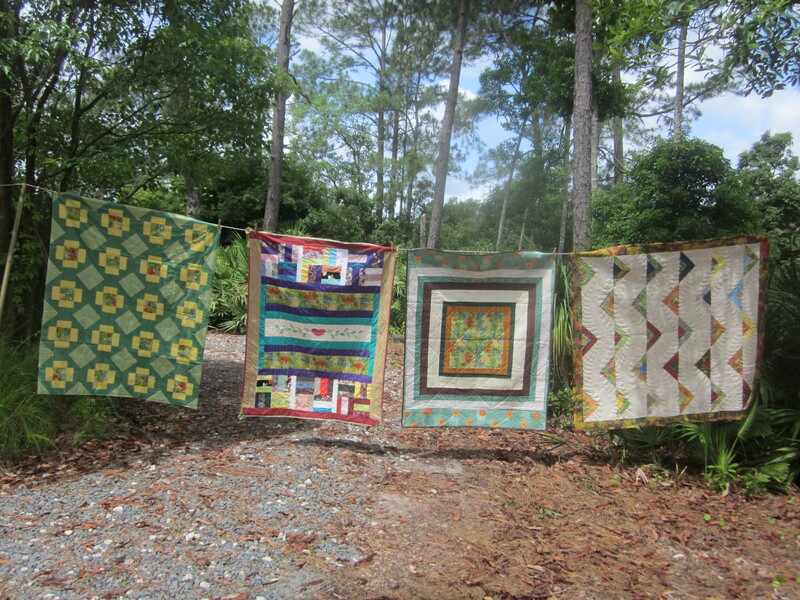 There’s a luncheon and while they’re eating I hang the quilts on the clotheslines. 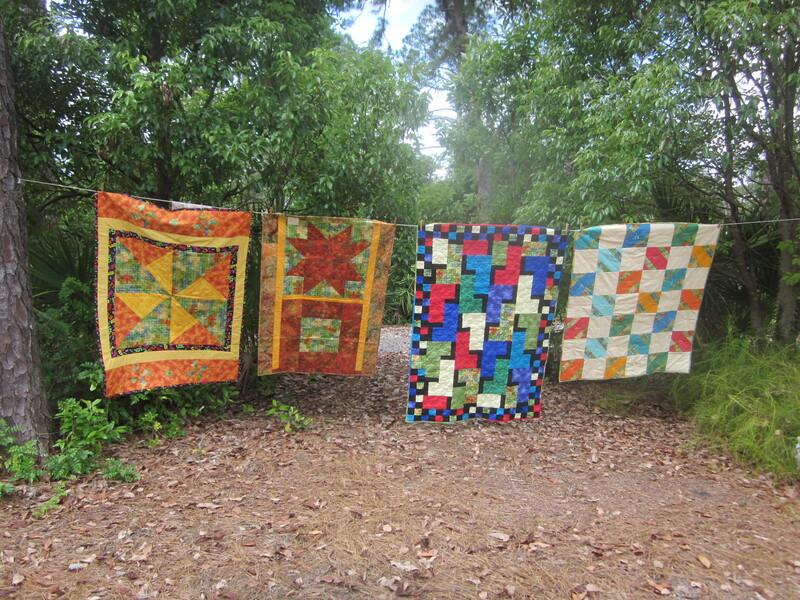 Supposedly no one has seen anyone else’s quilt prior to this event. I’m not sure exactly what the rules are but they all use the same fabric or something like that. The only fun thing that happened on my end was that I needed a clothes prop at one spot to keep a quilt from dragging on the ground and picked up a bamboo pole that was resting up against a tree. It worked fine and then I noticed it was full of very large ants that were crawling all over the quilt. I can write this because I know none of them read my blog. I managed to remove the pole and pick off all the attackers without raising any attention. My neighbor, Harvey, left me another load of fish carcasses hanging on the gate of the garden. They’d had a good day somewhere and there were probably 15-20 speckled perch bodies to deal with. He keeps smaller ones than I’d ever consider but………. The last time he brought me this large a batch was when I had the vulture problem a day later. I decided to try to outsmart them this time – forgetting the rule of messing with Mother Nature. I dug a trench in the 2’ wide space that runs between the trellis and the fence. It’s a good space to garden and I’m thinking it’s so narrow that the birds will have a harder time dealing with it. I grew really nice lettuce there earlier this spring and intended to leave it untended until the fall to reprise the lettuce crop. Next I stuck PVC strips vertically along the row every foot or so, cutting the landing space even smaller. Also put in a few horizontally spanning between the fence and the trellis. Last, and probably least, I spread commercial fertilizer along the row, thinking that perhaps that will mask the odor of the decaying fish and/or make the overall dining experience too nasty for the buzzards. They won last time but I didn’t know it was a battle until it was over. This time………….. I may have one other thing going for me this time – the fish are fresh. Last time they were really ripe before he brought them over so perhaps the decaying process will have run the course before the birds even know they are there. Big adventure day. We took the Sunrail from Debary to Church Street Station in downtown Orlando, had lunch with Tom, and visited a quilt show at the Orlando History Museum. We had been trying to schedule the trip for a month and ran into interference each time – weather or other conflicts. It was certainly more relaxing than driving on the interstate and worrying about downtown parking. When we got home, George greeted me with another bucket of fish carcasses – this time catfish. I’m running out of places to plant them and wonder if this added load will really call out to the buzzards. This time I covered them and placed bricks overtop the sites. Somebody called Nancy to play bridge at Palm Coast so it seemed like the right time to renew our Friday ritual of her playing cards and me surf fishing. I really enjoyed the day at the beach and did manage to catch a fish even with the wrong tide and the cold wind blowing directly out of the northeast, just short of gale speed. I didn’t fish too long and decided just to cruise the beach from just south of Ormond to Marineland, about 20 miles north of Flagler. If that ride was any indication, it’s going to be a banner year for beach businesses. The crowds were fourth of July size on an early May weekday. Saw lots of teens that I would have expected to be in school. I hope Friday’s not the new Saturday. Side affect from the blood thinner – sensitive to cold. When it gets below 70, I get cold; low 60’s, I’m shivering cold.